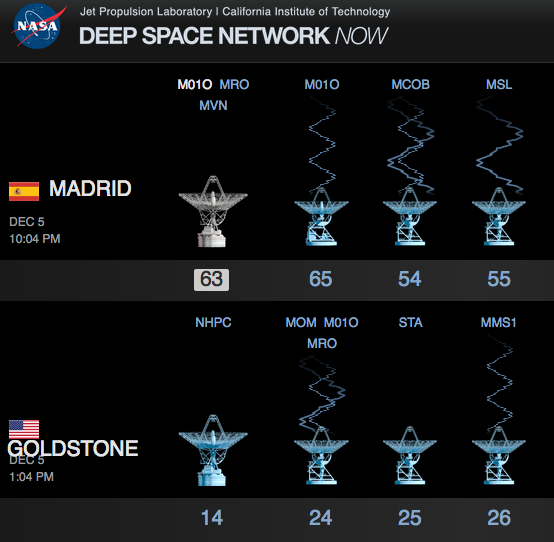 NASA communicates with spacecraft beyond Earth orbit using the Deep Space Network, which has three complexes: Canberra, Australia; Goldstone, California; and Madrid, Spain. MMS, NHPC, and STA are not Mars missions. How common (in hours per day, or a fraction, or percent) are two of the DSN complexes in a position to communicate with Mars? If the answer varies with the orbits of the two planets, please elaborate. "Overlap in the incoming and outgoing Deep Space Station’s (DSS's) uplink/downlink windows" is about using more than one complex in an array, which is not the case here. "How many space-craft can a station on the DSN communicate with concurrently?" is about Multiple Spacecraft Per Aperture (MSPA). Here is a quick answer for today. It varies as Earth and Mars move in their orbits. This script can be adjusted to other dates or bodies. 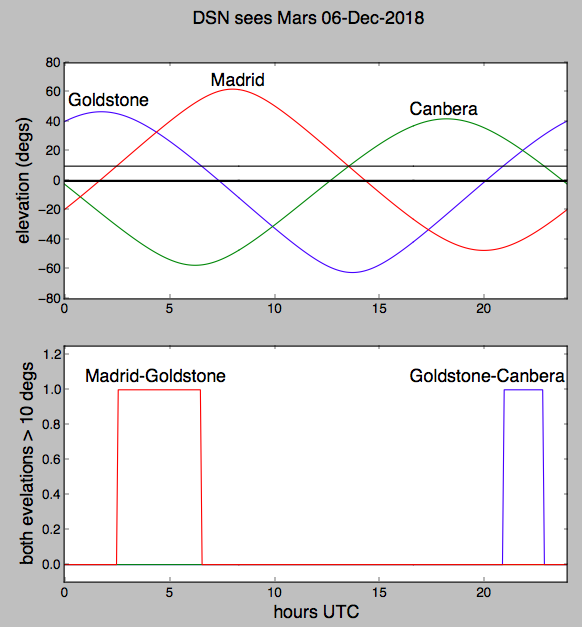 Today Madrid-Goldstone have about 4 hours of observing with Mars 10 degrees above the horizon, and Goldstone-Canbera have a little less than 2 hours. Next week or next month it will be different. 10 degrees is an arbitrary limit and usually one would like to be higher than that. I have not checked about hardware limits. Both the sky noise increases and side lobes will pick up more ground noise (both are thermal noise) as you get closer to the horizon. Would be worse for a very weak signal in very deep space like the Voyagers or New Horizons. update: Here is the calendar year 2018. 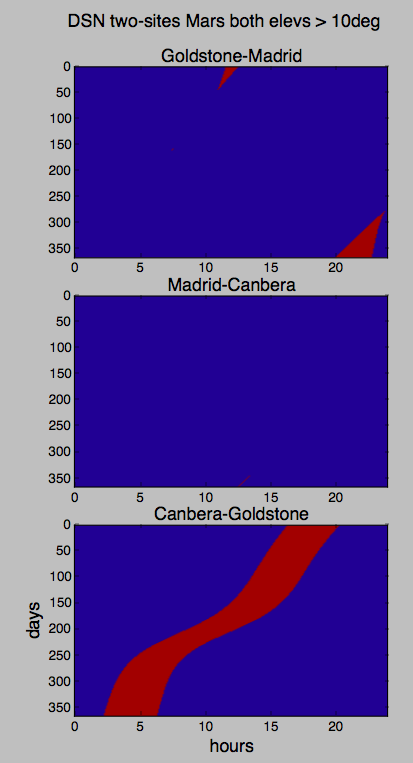 The Boolean plots are the envelopes for Mars elevation at both sites above 10 degrees. 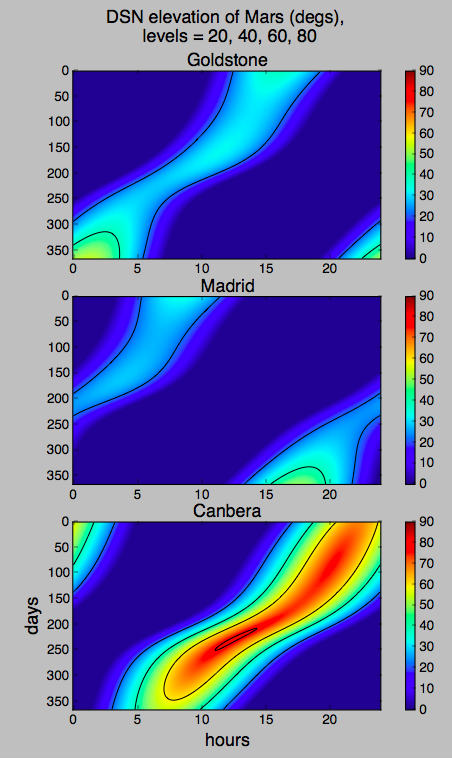 The color plots are Mars elevation angle for each site. Not the answer you're looking for? Browse other questions tagged mars deep-space-network or ask your own question. What was happening with the DSN/ Cassini? Missions at or soon-to-be at Mars and their DSN “codenames”?